The term infrared simply means "beyond red". When we talk about recording infrared images we are referencing the ability to record part of the light spectrum that our eyes are not sensitive to (longer wavelengths than the visible spectrum). We can divide the infrared spectrum into two parts, the near-infrared section that is just beyond the red portion of the spectrum and far-infrared which refers to the energy objects radiate when they are heated (also known as thermal infrared). 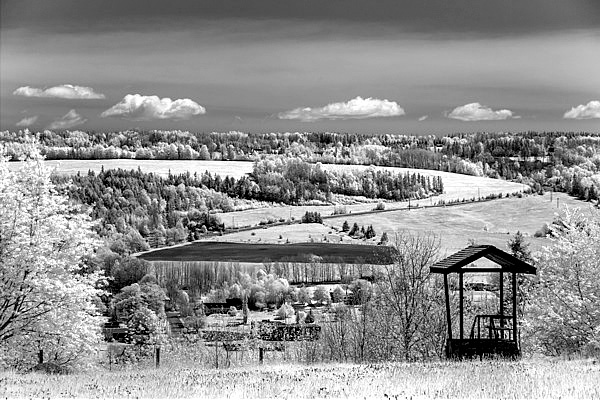 This page is dealing with near-infrared photography. 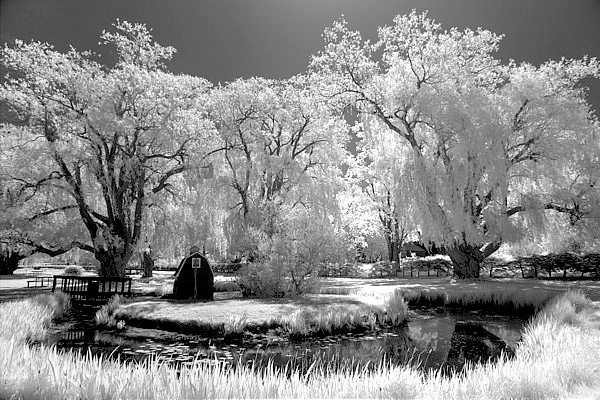 Near-infrared photography records the infrared light that is reflected off an object (normally from the sun) and some objects reflect more infrared light than they do in the red, green or blue part of the spectrum. 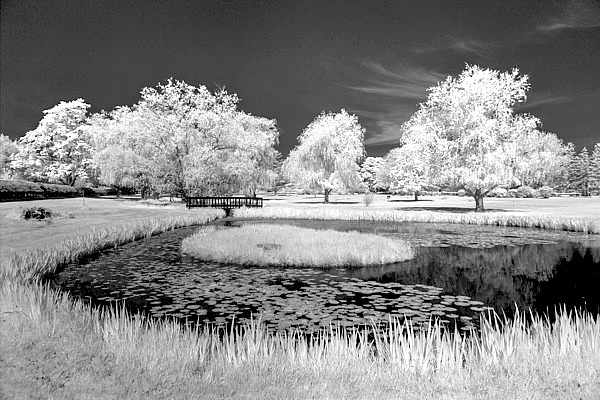 You will find that green grass and healthy vegetation often reflect more infrared light than other parts of the spectrum (that’s why grass and healthy vegetation look so bright) and water or blue skies reflect very little infrared light relative to other parts of the spectrum (this is why water and a blue sky look dark or black). This shift in brightness values compared to the visible spectrum is what makes infrared images look so unique. Most cameras aren’t sensitive to the infrared portion of the spectrum, in fact many camera manufacturers place infrared blocking filters in front of the camera’s sensor so no infrared light can get through. This is done because infrared light doesn’t bend the same way when it travels through the lens so the infrared light (if it did get through to the sensor) would create an out of focus image on the sensor. Not all infrared blocking filters are created equal. Some cameras have infrared blocking filters that aren’t 100% effective and some infrared light does make it through to the sensor (but not enough to effect the normal image). We can take advantage of this less than perfect infrared blocking filter by placing an infrared transmission filter in front of the lens. This transmission filter blocks the red, green and blue light from getting to the sensor but allows infrared light through which makes it possible to record an image from the reduced amount of infrared light that can make it past the in-camera infrared blocking filter. 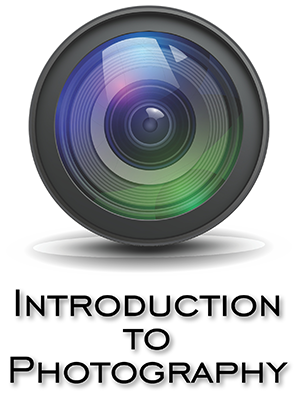 Not all cameras can record infrared even with an infrared transmission filter attached so you will need to do some online research to see if your camera will work. In order to record an image from the little infrared light that does make it to the sensor we will need to leave the shutter open for a long period of time (well over a second in many cases). This means you will need a tripod to keep your camera steady. Another problem you will run into is a focusing issue. Infrared light doesn’t bend the same when it passes through the lens so the focusing won’t be the same as images with visible light. You will need to experiment with manual focusing in order to get a sharp image. Your camera’s light meter probably isn’t calibrated for infrared light so the light meter may not give you the correct exposure. You will need to record some images under different lighting conditions and take note of the exposure settings that work for these situations. 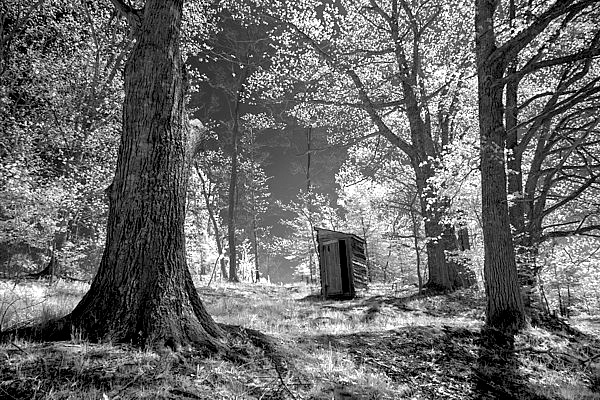 Once you start recording infrared images (and keep track of the focus and exposure settings for each situation) you will soon become proficient in recording interesting infrared images. What filter will you need? 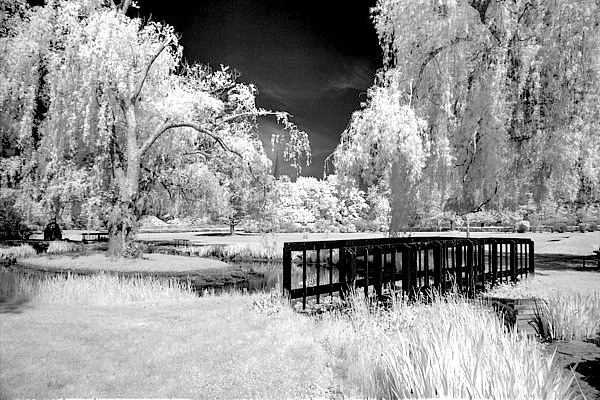 I used a B&W 093 infrared transmission filter but there are many other filters available from other manufacturers that will work just fine. I chose this filter because it was a good quality filter and it blocked all visible light; some filters let a bit of the red portion of visible light through which creates different but just as interesting images. 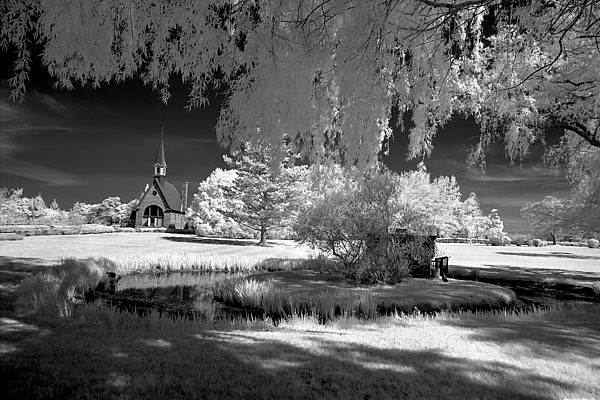 One drawback with an infrared transmission filter like the one I just mentioned is that it is opaque (you can’t see through it), this makes focusing and composing the image impossible, so you will need to perform these tasks before you attach the filter. This makes the process a bit slow but it gets you the images you need. If you want to go into infrared imaging in a big way you can always have one of your cameras converted so it records only infrared images. 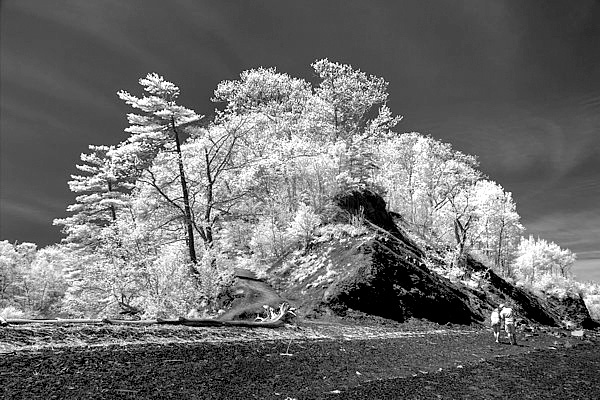 This camera conversion is more expensive than just purchasing a filter but it can make recording infrared images much easier and more efficient. Once a camera has been converted you don’t have the focusing and exposure issues we discussed earlier. If you’re serious about infrared imaging, this would be the way to go. Just do an internet search for “infrared camera conversion”. 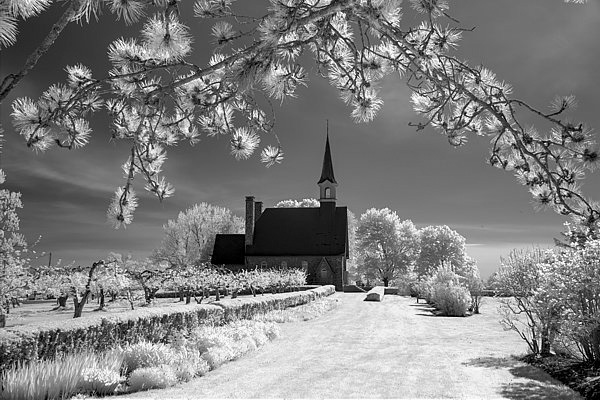 Once you have recorded your infrared image you may need to manipulate it in an image processing software package to create the image you like. 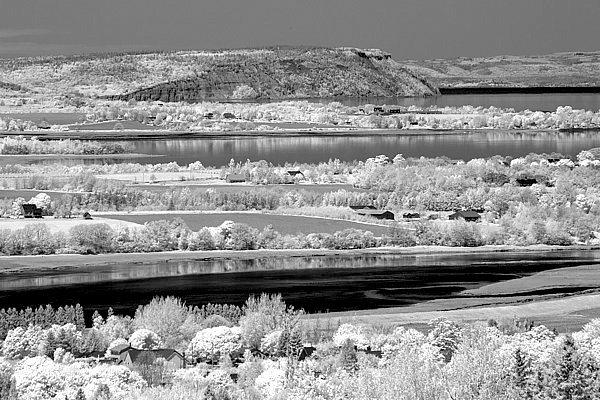 Unless you are recording image with a filter (or camera conversion) that lets part of the visible spectrum through, you will probably find it helpful to convert the RGB image into a grayscale image before you apply any enhancements.